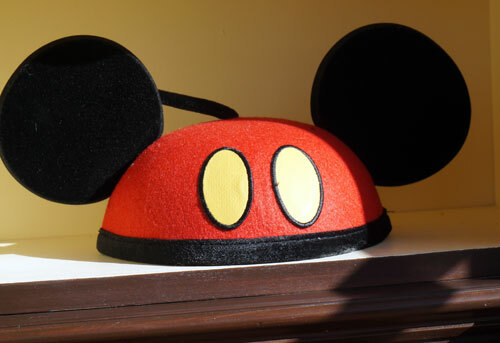 It contains some unique design elements, attraction innovations, and good old magic that makes even some of the low-tech experiences very enjoyable. Walt always wanted to make sure that the integrity of the 3D, living story he was telling in his theme parks was never destroyed. He didn’t want a cast member (the Disney term for an employee) wearing a futuristic Tomorrowland costume (the Disney term for a uniform) walking through medieval Fantasyland. Why? Because people from the future don’t belong a time when kings ruled their kingdoms. It ruins the effect and the story. To deal with this issue, Walt built a series of Utilidors, or utility corridors, under the Magic Kingdom. These include delivery tunnels, control rooms, and offices that exist beneath the “street” level where guests enjoy the parks. The Utilidors allow Disney to not only efficiently deliver people and supplies to where they are needed but also to help protect the integrity of the story of each themed area. The Utilidors ensure that people who don’t naturally belong in the story of a certain area don’t show up there. Technically, Utilidors aren’t underground at the Magic Kingdom. Given the high water table in Florida, it isn’t possible to build a true basement, or level beneath street level. So the Utilidors were actually put at ground level, and the street level that the theme park guests see is technically the second level of the Magic Kingdom. Sadly, Disney hasn’t used the innovative Utilidoors concept in other parks built after the Magic Kingdom – it is simply cheaper to put a perimeter road around the edge of a theme park. As Disney designed the Magic Kingdom he also added some interesting features above the ground. 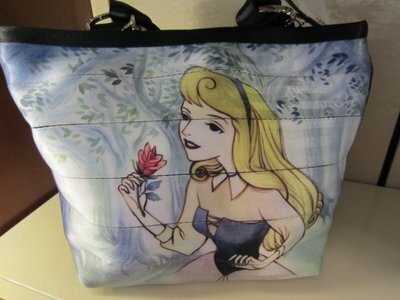 One that is hard to miss in Cinderella Castle. The castle was completed in 1971 after a construction period lasting 18 months. The castle is 189 feet tall – just short of the 200 feet in height that would require that the castle have airplane beacons which would have ruined the effect of an old time structure. Forced perspective makes the Castle look much taller than it actually is. 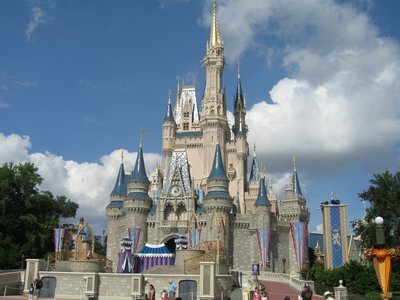 The castle and many other building throughout Disney theme parks use forced perspective to make them appear bigger than life. As the various parts of the castle get taller, they also get smaller. This means that the top spire of the castle is about half of the size that they eye perceives it to be in perspective. 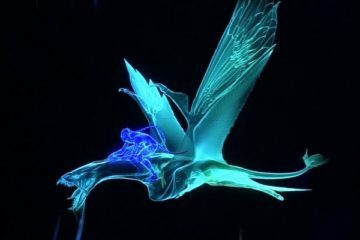 This is why, when the Tinker Bell character “flies” on a wire out of the castle toward Tomorrowland during the start of evening shows, she is not illuminated by a spot light until she is several feet away from the castle. If you were to see a normally sized human playing Tinker Bell standing at the top of the castle, she would look huge because the upper elements of the castle are built smaller to generate the forced perspective. 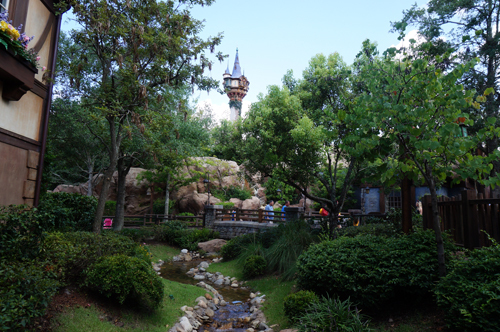 The buildings along Main Street USA and in many other parts of the Magic Kingdom also use forced perspective. They are often built where the first floor is 80% of a normal scale, the second floor is 60% of a normal scale, and the top floor is 40% of a normal scale. This special scale allows the buildings to look life sized without all the material needed to build a true full sized building. 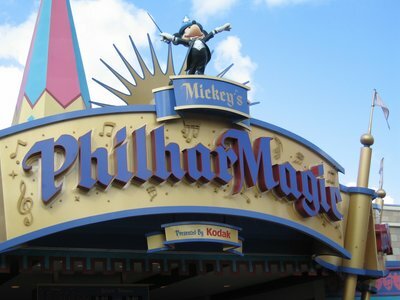 PhilharMagic is a 3D movie experience that took an amazing three years to complete. When the orchestra doesn’t show up for a performance, Donald Duck takes things into his own hands – and lead you on an amazing journey of Disney movie and music. You will enjoy the music from Disney classics, including a show-stopping “Be Our Guest” performance by the characters of Beauty And The Beast, a “Whole New World” magic carpet ride with Aladdin and Jasmine, and a “Just Can’t Wait To Be King” reprise by the Lion King. 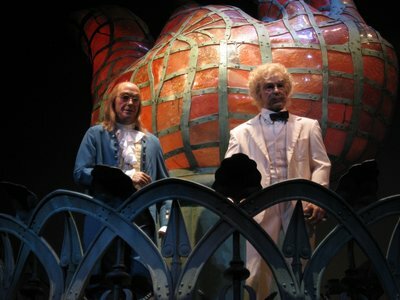 The theater for PhilharMagic contains the world’s biggest movie screen that doesn’t have seams. Since Disney wanted everything to be just right, they did their best to use the original animators to supervise the development of the 3D characters and animations. Mickey’s PhilharMagic is a fun 3D movie with plenty of Disney characters. 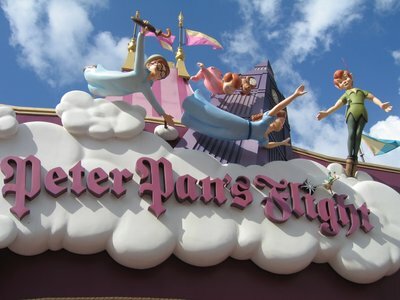 Peter Pan’s Flight was one of the original attractions that opened with the Magic Kingdom in 1971. And it hasn’t really changed since then. There isn’t much animation and the attraction is decidedly low-tech. But there is still something special about boarding a pirate ship, suspended from above, where you fly over scenes of Wendy’s bedroom, old time London, and Captain Hook and Peter dueling. As you look down from your ship at the scenes below, you can imagine what it might be like to fly like Peter Pan and Tinker Bell did in the classic movie. Soar over London in the classic dark ride Peter Pan’s Flight. 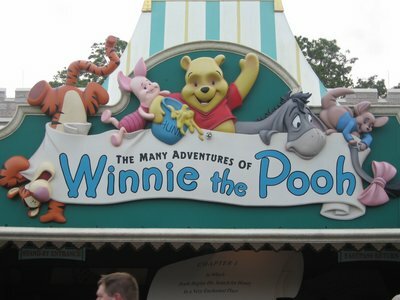 The Many Adventures of Winnie the Pooh is a relative newcomer to Fantasyland, having opened in 1999. Your own personal honey pot takes you through a tour of the Hundred Acre Woods where you can see Winnie the Pooh and his friends, including Tigger, Piglet, and Owl. Interestingly, there used to be FastPass machines at this attraction so that you could reserve a time to ride without waiting in line. They are now gone. Based on what some people predict is a future trend in Disney technology, the Imagineers have worked to make the wait more interesting. As kids step on special mats, gophers pop up. Little ones can spin, pound, and play with many of the new toys along the way. A wall that seems to be made of dripping honey is actually interactive – kids love to reach out and touch it to see what happens. Check out what’s going on in Hundred Acre Woods in the Many Adventures of Winnit the Pooh. There are many other attractions and magical design touches that we haven’t touched on, including Prince Charming Regal Carrousel, Dumbo the Flying Elephant, It’s a Small World, and the ever popular Mad Tea Party. 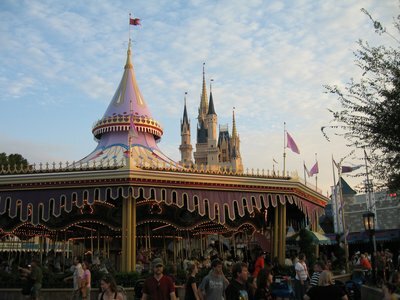 The Price Charming Carrousel is located just behind Cinderella Castle. 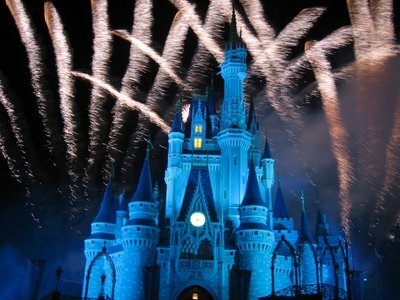 With clever design techniques like Utilidors and forced perspective, and attractions built to share a story and entertain, Disney uses some amazing techniques to build theme parks unlike any other.